Gone but not forgotten. Rest easy Trooper. I meant to say I hope they catch that low life woman and bring her back to the U. S. to face justice. Rest in peace Trooper Foerster. 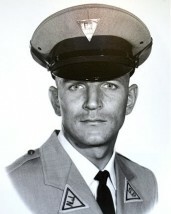 You served the citizens of NJ as a proud & dedicated New Jersey State Trooper. You will NEVER be forgotten. I wanted to leave my sympathies on your tragic death. I was scanning the ODMP page and came across your story on today's date. The bravery and courage you displayed will never be forgotten by your family, friends and colleagues. My dad was a New York City policeman with the 102 precinct for almost 40 years. I hope that catch that low life woman who fled like a coward to Cuba and bring her back to our country to face the justice your family deserves. Rest in peace trooper Foerster and Olav Hhashalom. Rest In Peace Trooper Foerster!! To the Family and Fellow Troopers of Werner Foerster We will not forget this Brave Warrior. May he rest in Peace, and May His family have God's Blessing of Peace in their Hearts. May his killers pay the full price for their horrific crime. East Buffalo Twp Police, Lewisburg, Pa. Though I never knew him, he was part of my Law Enforcement family and I will mourn this deep loss the rest of my life. My heart aches with all the losses we have suffered, and continue to suffer, through the years. God is our only peace in such incidents & our only real comfort comes from Him. May His strength, comfort & peace continue to be the sustaining force in the lives of all who knew this beloved officer; and may it somehow help to know he is not forgotten. Time has moved on, but we all remember what happened that day when the cowards gunned you down. I know the NJSP will never forget you and will bring the culprit to justice. I remember attending your service with my team of Narcotic Detective's in uniform . You will never be forgotten. May God continue to watch over you and your family. On today, the 36th anniversary of your death I would just like to say thank you for your service and sacrifice for the citizens of the state of New Jersey. And to your family and loved ones, I wish to extend my deepest sympathy. I just read about this officer who gave the ultimate sacrafice. I was reading Fox Channel news and came across a story about the murderer (but of course the Officer is dead and buried and no one cares). I have been in a relationship with a police officer for five years and after reading the poem "the Badge" it brought tears to my eyes and seeing Trooper Foerster's picture made is worse. I don't know if anyone reads these things, but I do understand what it's like and I would never want anyone else in my life except the police officer I am with now. He is brave, smart and genuinely helps when he can but the horrors he sees and tells me about, I will never know. He has changed me and now I am training to be an EMT to try and understand what these brave men and women go through. I hope Trooper Foerster's family has been able to move on, but they should always be honored and proud to have had this man in their lives for the short time they did. What goes around comes around and on Judgment Day the murderer will be Judged-that is what we all must hold on to. Today in the media, movies, music, television and published books there are too many refferences to the killers than thoese who were slain and took from this earth way too early. I would like to work with someone and create a scrip or treatement for a motion picture of Trooper Foerster's life and how it was tragically taken. Rest in peace my Brother. To the family, friends and colleagues of Trooper Foerster, please know that a day does not go by where this brave Trooper is not thought of for his bravery and sacrifice. Trooper Foerster is part of God's elite police force watching over his law enforcement brethren from above and one day we will meet in a better place. On the anniversary of your sacrifice 34 years ago we remember you. god speed. We offer our heartfelt sympathy to the family, friends and colleagues of Trooper Foerster and we honor his distinguished service to the cause of justice and peace. Sadly, our nation has lost one of its finest citizens, a community has lost a friend and protector, and a family has lost an example of character and courage who they will love and respect forever. Today, because of the sacrifice Trooper Foerster has made, the house of freedom is stronger, sturdier, and more secure. To the family and friends of Trooper Foerster, I would like you to know that a lot of people pray for you, and my hope is that their prayers will give you the strength necessary to move on. Just as you were always with him when he walked the beat or patrolled the streets, know that he will always be with you - wherever you may be. In the days to follow, may you be strengthened by the fact that Trooper Foerster is a man distinguished by exceptional courage and will always be admired for his brave deeds and noble qualities. You, your family and your sacrifice will never be forgotten. I HAVE SEEN OVER THE YEARS IN MY TRAVELS ON RT 18 THAT THE OVERPASS THAT PASSES OVER THE TURNPIKE WHERE YOU GAVE YOUR LIFE FOR US, WAS NAMED THE WERNER FOERSTER OVERPASS IN YOUR HONOR. YESTERDAY, I EMAILED THE ODMP NOTIFYING THEM OF THIS HONOR BESTOWED ON YOU. TODAY, THEY SO GRACIOUSLY UPDATED YOUR PROFILE NOTING THAT HONOR. I SENT THIS TO THEM SO EVERYONE WHO READS THIS PROFILE KNOWS THE SPOT NAMED FOR YOU, AND IF THEY HAVE OCCASION TO PASS THIS SPOT, THEY WILL SAY A PRAYER FOR YOUR FAMILY, AND ALL OF OUR POLICE OFFICERS WHO RISK THEIR LIVES DAILY TO KEEP US SAFE. MAY YOU REST IN PEACE TROOP. YOUR KILLER WILL GET HERS. SHE MAY NOT BE JUDGED IN OUR EARTHLY COURTS, BUT SHE CANNOT ESCAPE THE ULTIMATE JUDGEMENT. I PRAY THAT WE WILL GET HER OUT OF CUBA ONE DAY, AND HAVE HER BROUGHT TO JUSTICE IN NJ SUPERIOR COURT. God bless you Trooper Foerster. You are in heaven now and that --------- is hiding in Cuba, just waiting to meet the Devil. REST IN PEACE SIR! YOUR SACRIFICE WILL NOT BE FORGOTTEN! May you rest in peace, Sir! You are not forgotten.